BACKGROUND AND PURPOSE: Endoluminal reconstruction with flow diverting devices represents a novel constructive technique for the treatment of cerebral aneurysms. We present the results of the first prospective multicenter trial of a flow-diverting construct for the treatment of intracranial aneurysms. MATERIALS AND METHODS: Patients with unruptured aneurysms that were wide-necked (>4 mm), had unfavorable dome/neck ratios (<1.5), or had failed previous therapy were enrolled in the PITA trial between January and May 2007 at 4 (3 European and 1 South American) centers. Aneurysms were treated with the PED with or without adjunctive coil embolization. All patients underwent clinical evaluation at 30 and 180 days and conventional angiography 180 days after treatment. Angiographic results were adjudicated by an experienced neuroradiologist at a nonparticipating site. RESULTS: Thirty-one patients with 31 intracranial aneurysms (6 men; 42–76 years of age; average age, 54.6 years) were treated during the study period. Twenty-eight aneurysms arose from the ICA (5 cavernous, 15 parophthalmic, 4 superior hypophyseal, and 4 posterior communicating segments), 1 from the MCA, 1 from the vertebral artery, and 1 from the vertebrobasilar junction. Mean aneurysm size was 11.5 mm, and mean neck size was 5.8 mm. Twelve (38.7%) aneurysms had failed (or recurred after) a previous endovascular treatment. PED placement was technically successful in 30 of 31 patients (96.8%). Most aneurysms were treated with either 1 (n = 18) or 2 (n = 11) PEDs. Fifteen aneurysms (48.4%) were treated with a PED alone, while 16 were treated with both PED and embolization coils. Two patients experienced major periprocedural stroke. Follow-up angiography demonstrated complete aneurysm occlusion in 28 (93.3%) of the 30 patients who underwent angiographic follow-up. No significant in-construct stenosis (≥50%) was identified at follow-up angiography. CONCLUSIONS: Intracranial aneurysm treatment with the PED is technically feasible and can be achieved with a safety profile analogous to that reported for stent-supported coil embolization. PED treatment elicited a very high rate (93%) of complete angiographic occlusion at 6 months in a population of the most challenging anatomic subtypes of cerebral aneurysms. A new generation of flexible self-expanding, microcatheter-delivered, high-metal-surface-area coverage, stentlike devices has emerged, which represent a fundamentally different approach to the endovascular treatment of IAs.1,2 These flow-diverting devices are designed to achieve aneurysm occlusion through the endoluminal reconstruction of the diseased segment of the parent artery that gives rise to the aneurysm. This approach potentially represents a more physiologic, definitive, and durable treatment of IAs in comparison with endosaccular coil embolization.1–3 We present the results of the PITA trial, the first multicenter prospective study of intracranial aneurysms treated with a flow-diverting construct (PED; ev3/Chestnut Medical, Menlo Park, California). The PED is a flexible microcatheter-delivered self-expanding cylindric construct composed of 48 braided strands of cobalt chromium and platinum. The individual strands measure between 28 and 33 μm in diameter (0.0011–0.0013 inches). When fully expanded to nominal diameter, the construct provides approximately 30%–35% metal surface area coverage. The construct is packaged collapsed on a delivery wire and contained within a delivery sheath. When collapsed, the construct is elongated approximately 2.5 times its nominal length (which is achieved when the construct is fully expanded). All patients were pretreated with aspirin and clopidogrel and were treated under general anesthesia. Procedures were performed through a 6F-8F femoral artery access. Following arterial access, patients were typically administered intravenous heparin to achieve an activated clotting time of >250 seconds. A 6F guiding-catheter system was placed into the distal cervical segment of the vessel leading to the intracranial vessel targeted for treatment. A standard 0.027-inch ID microcatheter (Renegade Hi-Flo; Boston Scientific, Fremont, California) or Masstransit (Cordis Neurovascular, Warren, New Jersey) was then manipulated over a 0.014- to 0.018-inch outer diameter microwire (Synchro-14 or Transend-14 or Transend-18, Boston Scientific) into position across the aneurysm neck. When coiling was performed in conjunction with PED treatment, a standard microcatheter was navigated into the aneurysm alongside the 0.027-inch microcatheter within the parent artery. Once the microcatheter was in position, the PED was loaded via a rotating hemostatic valve into the hub of the 0.027-inch ID delivery microcatheter and advanced with the delivery wire. The device was then deployed across the targeted landing zone through a process of microcatheter unsheathing and delivery-wire stabilization/advancement. Once deployed, the delivery microcatheter was advanced over the delivery microwire to recapture the microwire and re-establish its position across the construct. Additional PEDs were then deployed (if needed) through the delivery microcatheter by using the same technique. Once the PED construct was in place, if coil embolization was to be performed, coils were deployed within the aneurysm through the jailed microcatheter via a parallel technique. Following coil embolization, the coiling microcatheter could be gently removed from the aneurysm without displacing the construct. Completion angiography was performed in the working angles for PED reconstruction as well as in the standard branch vessel projections. Neurologic status was assessed before treatment, immediately after treatment, and at discharge. Subjects underwent mandatory clinical follow-up at 30 days and 180 days with repeat angiography at the 180-day follow-up to assess IA occlusion and PED status. Patients continued clopidogrel therapy (75 mg by mouth daily) for a minimum of 30 days after treatment and aspirin therapy (100 mg by mouth daily) for a minimum of 180 days after treatment. The primary end points of the study were device-placement success (defined as the successful placement of at least 1 PED at the targeted landing zone) and the incidence of 30-day death or ipsilateral stroke. Secondary end points were clinical procedure success (device-placement success in the absence of periprocedural stroke/death), complete aneurysm occlusion at 180-day angiographic follow-up, incidence of new neurologic deficits after treatment, change in the Barthel Index, and rate of distal device migration. Site investigators entered data on preprinted case report forms and all case-report-form data were monitored by an external contract research organization (Clin-Assist, Pacifica, California). Data were entered into a data base, and all queries were resolved. Data were analyzed by using SAS software (SAS Institute, Cary, North Carolina). Confidence intervals for continuous outcomes were calculated by using standard methods. All angiograms were reviewed by a single experienced neuroradiologist (S.G.W.) who did not participate in any of the procedures. Aneurysm occlusion grade, in-construct stenosis, and device migration were assessed. Aneurysm occlusion was graded by using a 3-point modified Raymond scale.5 In-construct stenosis was calculated on the basis of the minimal luminal diameter and graded as none (0 to <25%), mild (>25 to <50%), moderate (>50 to <75%), or severe (>75 to 100%). Device migration was defined as the movement of the device ≥5 mm from its originally deployed location. Thirty-one patients with 31 aneurysms were enrolled between January and May 2007. Twenty-five patients were women. Average age was 54.6 years (range, 35–76 years). Twelve (38.7%) patients had undergone prior treatments of the target IA: 8 with coils only, 2 with stents only, and 2 with both coils and stents (Fig 1). Twenty-two (71%) of the aneurysms were wide-neck, 9 (29%) were large (>10 mm), and 2 were giant (>25 mm). Mean aneurysm size was 11.5 mm, and mean neck width was 5.8 mm (Table 1 and Fig 2). Laterally projecting left carotid aneurysm with residual filling after prior coiling. A, Subtracted carotid angiography in the frontal-projection working angle demonstrates residual filling of the aneurysm neck extending into the proximal fundus. B, Unsubtracted frontal projection in the working angle demonstrates a PED in position across the aneurysm neck. No additional embolization coils were added. The gap between the coil mass and PED construct (arrow) indicates the region of residual aneurysm filling. C, Follow-up angiogram in the frontal projection 6 months after treatment shows complete occlusion of the aneurysm. D, A native image in the frontal projection shows that the gap between the coil mass and PED construct has resolved (arrow). This finding indicates that the aneurysm has not only undergone complete thrombosis, but that the thrombus mass has been resorbed in the interim with contraction of the intra-aneurysmal thrombus-coil mass complex around the outside of the construct. Dysplastic wide-neck partially thrombosed aneurysm arising from the proximal cavernous segment of the internal carotid artery. A and B, 3D images reconstructed from rotational angiographic source data demonstrate that the neck of the aneurysm incorporates >180° of the vessel circumference over a 10-mm segment of the carotid artery. C, Conventional angiography in the lateral working projection depicts the partially thrombosed wide-neck aneurysm arising from the circumferentially diseased segment. Just proximal to the aneurysmal segment is a mild focal stenosis (arrow). D, Native image in the lateral working-angle projection after treatment demonstrates the Pipeline construct in place across the aneurysm neck, with a loose packing of the aneurysm with embolization coils. E, Follow-up angiography at 180 days in the lateral working projection shows total occlusion of the aneurysm as well as complete anatomic remodeling of the diseased parent artery. The dysplastic aneurysmal vascular segment now has a smooth tubular configuration. The proximal stenosis has also completely remodeled and now is normal in caliber. In total, 47 devices were placed (1.52 devices per aneurysm). In 18 cases, a single PED was used (Table 1). Adjunctive coils were placed in 16 aneurysms (51.6%), and 15 aneurysms were treated with PED reconstruction alone. A Neuroform stent (Boston Scientific) was used in 1 case to anchor the proximal end of 2 telescoping PEDs implanted within the left M1 segment of the MCA. Forty-six of 47 PEDs were implanted successfully (97.9% device-placement success). In the 1 unsuccessful PED placement, there was diminished flow in the parent ICA following deployment of the PED and coiling of the remnant aneurysm sac. During angioplasty performed to correct the attenuated flow, the ICA beyond the implant was ruptured. The indwelling PED and aneurysm coils were removed during an attempted surgical repair of the ruptured artery, and the carotid artery was ultimately ligated. In the remaining 30 patients, the entire neck of the target IA was successfully covered by the PED construct. Device-deployment success (passage of the PED through the microcatheter and release at the target site) occurred in 47 of 54 attempted PED deployments (87%). In 6 cases, a PED was introduced into the microcatheter but the physician could not deliver the device to the targeted landing zone, typically due to excessive friction within the delivery microcatheter. In 1 additional case, a partially deployed PED was judged to be in a suboptimal position and was removed before full deployment. In all cases, successful device deployments were achieved on reattempted delivery during the same procedure. Deployment failures did not result in any adverse events. Clinical procedure success (device-placement success without in-hospital neurologic death or ipsilateral stroke) was achieved in 29/31 (93.5%) patients. Two patients had major stroke. The patient with iatrogenic rupture of the distal ICA had a large left-hemisphere stroke. A second patient experienced a periprocedural stroke manifest as right-sided hemiparesis and motor aphasia following reconstruction of the M1 segment of the left MCA with 2 overlapping PEDs and a Neuroform stent followed by coil embolization of a giant M1 aneurysm. CT imaging 2 days after the procedure showed a left deep gray matter infarction. Speech function improved significantly during the periprocedural hospitalization with marked additional improvement observed at the 30-day postprocedural visit. This event may be attributable to the coverage of regional lenticulostriate branches with multiple PEDs as well as technical complexities encountered during the placement of telescoping PEDs and an anchoring Neuroform stent as well as the subsequent coiling of the giant (25 mm) aneurysm. No subject experienced clinically significant bleeding with the use of aspirin and clopidogrel. Apart from the 2 patients with periprocedural stroke, no neurologic deterioration was observed in any of the patients at discharge. Diagnostic angiography at 180 days was performed in 30 of 31 patients and was assessed by an independent neuroradiologist (Table 2). Follow-up angiography was not performed for the patient in whom the PED had been surgically removed and the parent vessel ligated. Complete aneurysm occlusion was observed in 28 of 30 (93.3%) patients (Fig 3). Residual aneurysm filling was noted in 2 (6.7%). One of aneurysms not completely occluded at 180-day follow-up angiography had been treated with a conventional stent before PED treatment. One of the patients with an incompletely occluded aneurysm at 180-day angiography (the patient without an indwelling conventional stent) underwent an additional poststudy angiographic follow-up at 1 year, which demonstrated progression to complete aneurysm occlusion. Twenty-eight of 30 patients had no stenosis (0% to <25% stenosis) of the parent artery where the PED was placed. One patient showed mild (>25%–50%) stenosis but had no symptoms. In 1 patient, stenosis could not be evaluated because a large coil mass obscured visualization of a portion of the PED construct. Distal PED migration did not occur in any case. Left ICA parophthamalic-segment aneurysm in a patient with progressive ipsilateral vision loss. A and B, 3D reconstructed images from rotational source data show a very large wide-neck aneurysm arising from the parophthalmic segment of the left ICA. C, Initial angiogram in the frontal working projection demonstrates a very large aneurysm arising from the left ICA. D, Following reconstruction with a PED, filling of the aneurysm with contrast is diminished because flow has been redirected along the normal course of the ICA and into the left anterior circulation. The patient emerged from general anesthesia with an improvement in left-eye vision. E, A native image depicts the PED construct in position across the aneurysmal segment. F, Subtracted image from the 6-month follow-up angiogram shows anatomic reconstruction of the parent artery with complete aneurysm occlusion. G, Axial CT image at the level of the optic chiasm before treatment demonstrates the peripherally calcified fundus of the very large left ICA aneurysm projecting into the suprasellar cistern. H, Six-month follow-up axial CT image depicts a PED in place within the parent ICA with complete resolution of the aneurysm-thrombus mass. The suprasellar cistern, which was formerly effaced by the aneurysm, now appears normally filled with CSF. These serial images depict the physiologic progression that is possible in some cases after PED reconstruction—starting with mechanical flow diversion, progressing to physiologic aneurysm thrombosis and complete occlusion, followed by endoluminal parent artery reconstruction and, ultimately, anatomical restoration with resolution of the aneurysm-thrombus mass and dissipation of the regional mass effect. No delayed neurologic events occurred between discharge and 180-day follow-up. No delayed hemorrhagic complications related to aspirin and clopidogrel therapy were encountered. The most important observations of the PITA trial are the following: 1) The treatment of intracranial aneurysms with PED (alone or adjunctively in support of aneurysm coiling) was feasible with a high rate of technical success. 2) Definitive endoluminal reconstruction of the parent artery with PED was achieved with a level of procedural safety analogous to that reported for the conventional coil-based endosaccular treatment of complex intracranial aneurysms. 3) Parent artery reconstruction with PED yielded a rate of complete aneurysm occlusion at 180 days that approached 100% and exceeded that traditionally reported after conventional endosaccular aneurysm treatment. 4) PED implantation was not associated with a high prevalence of delayed in-construct stenosis or thrombosis during the study interval. 5) PED was not associated with delayed clinical neurologic events following treatment. Ultimately, successful placement of the desired number of PEDs across the aneurysm neck was achieved 98% of the time. During the PITA trial, the PED was deployed through approved microcatheters (Renegade Hi-Flo; Masstransit) that were not specifically designed for PED implantation. These microcatheters frequently “ovalized” or kinked around vascular turns and sometimes stretched during device delivery, making PED deployment challenging, particularly in tortuous segments of the cerebral vasculature. Since the completion of PITA, a microcatheter (Marksman, ev3/Chestnut Medical) has been specifically engineered for the delivery and deployment of the Pipeline. The availability of an optimized PED delivery catheter may significantly improve the ease of device placement and reduce the frequency of delivery-deployment failures. Two periprocedural neurologic complications were noted in the present series, both of which were major strokes. This rate of periprocedural complications (6.5%) is analogous to that reported for the endovascular treatment of aneurysms using other approved self-expanding intracranial microstents.22–24 One of the complications related to the placement of multiple PEDs within the M1 segment of the MCA to support endosaccular coiling of a giant aneurysm was an infarction in the territory of a lateral lenticulostriate branch. This complication, to some degree, reflects an earlier stage of understanding of the device, its optimal application, and its limitations. Currently, we do not recommend overlapping multiple constructs in regions giving rise to eloquent perforators. The rates of complete aneurysm occlusion achieved with the Pipeline surpass those reported in the literature for conventional endovascular endosaccular aneurysm treatments. In the present study, 93% of the aneurysms treated were occluded at 6-month follow-up. Moreover, 1 of the aneurysms that was incompletely occluded at 6 months progressed to complete occlusion by 12 months. These complete occlusion rates are even more impressive when considering that the types of aneurysms included in the present study—large, giant, wide-neck, and failed/recurrent—are those that are typically the most challenging for conventional coil-based endosaccular treatments. Because the efficacy of Pipeline reconstruction is not at all dependent upon the dense packing of the aneurysm fundus with embolic materials, the ability to achieve a complete and durable occlusion with the Pipeline is not dependent on the size or configuration of the aneurysm sac, the presence of intra-aneurysmal thrombus, or the width of the aneurysm neck. As such, wide-neck, fusiform, partially thrombosed, and very large-giant aneurysms may be particularly well-suited for endoluminal reconstruction. In the current series, 1 asymptomatic moderate-grade (25%–50%) stenosis was observed in the 30 patients presenting for angiographic follow-up. There were no cases of high-grade (>50%) or symptomatic stenosis observed during the 180-day follow-up after PED implantation. Because the Pipeline is a bare metal device, it would be expected that most in-construct stenoses would be observed within 3–6 months of implantation.25 As such, the present series suggests that in-construct stenosis observed after PED placement is likely to occur at a relatively low rate. The absence of delayed neurologic events following treatment suggests that, as with conventional endovascular aneurysm therapies, most complications with endoluminal reconstruction should be expected to occur during the early periprocedural period. Given that PED reconstruction results in a very high rate of complete aneurysm occlusion (approaching 100% in the present series) and conceivably will be associated with minimal or no recurrences after treatment, the requirement for multiple retreatments (and perhaps at some point continual angiographic or cross-sectional imaging surveillance) is likely to be substantially reduced if not eliminated altogether in most cases. This possibility is particularly important for large, giant wide-neck aneurysms and those that have failed prior treatment, because these lesions are notorious for recurrence following endovascular treatment and require long-term follow-up.5 This potential reduction in the rate of follow-up angiography and re-intervention could conceivably translate directly to lower cumulative risks for patients, fewer procedures, lower levels of radiation exposure, fewer hospital admissions, fewer imaging studies, and lower overall health care costs. The PITA trial demonstrates that the reconstruction of complex aneurysms with endoluminal devices is technically feasible and can be achieved with an acceptable level of periprocedural risk. 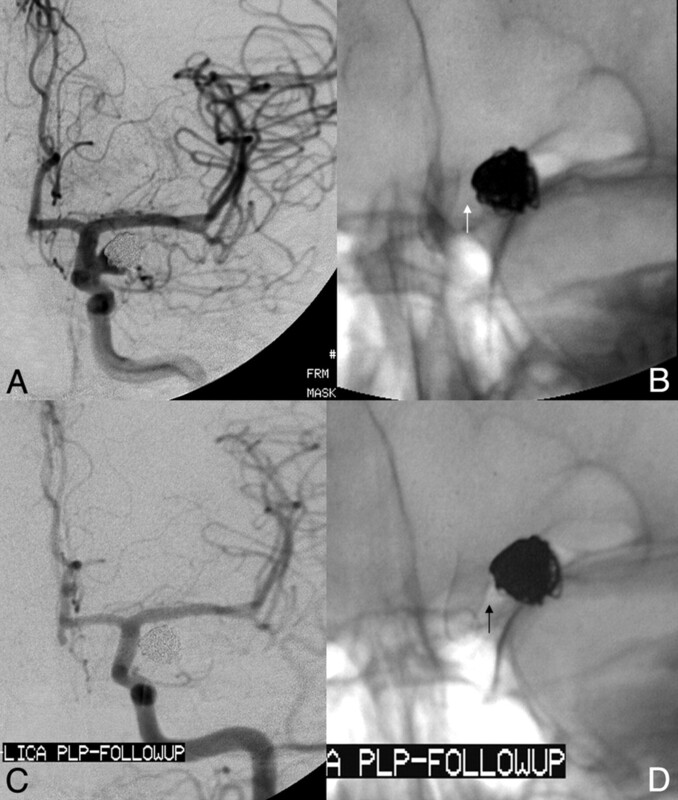 Complete angiographic occlusion of the target aneurysm was observed in a majority of cases (>90%), exceeding the occlusion rates reported after conventional coil-based endosaccular treatment strategies. It is likely that PED and similar endoluminal devices will play an important role in the future of endovascular aneurysm treatment. The optimal application of these devices will continue to be defined as clinical experience evolves. The authors wish to acknowledge the work of Prof. Guenther Klein, who functioned as the site PI for Medical University of Graz, Graz, Austria during the PITA study. The PITA trial was sponsored, funded, and conducted by Chestnut Medical Technologies. Dr Peter Kim Nelson is a stockholder and paid consultant for Chestnut Medical/ev3. Drs Szikora, Wetzel, and Lylyk are paid consultants and proctors for Chestnut Medical/ev3. Dr Fiorella is an unpaid consultant and proctor for Chestnut Medical/ev3. Paper previously presented in part at: International Stroke Conference, February 20–22, 2008; New Orleans, Louisiana. Accepted after revision October 12, 2010.